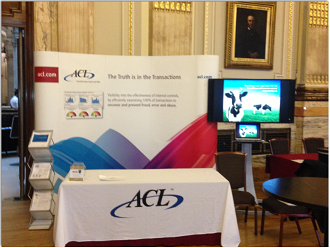 DataConsulting, in partnership with ACL, hosted a stand at the ‘Fraud and Error’ conference in London a few weeks ago. The event was attended by fraud, risk, audit and controls professionals targeted with detecting and preventing fraud within UK public services organisations.The one day conference included interesting sessions looking at developing a successful approach to fighting fraud as well as the real ROI of successfully detecting fraud. From a data analysis point of view, we enjoyed speaking with delegates about the various ways that fraud can manifest itself within the data. Traditionally fraud is detected (and hopefully rectified) on a reactive basis, such as when a credit card is hacked. By understanding the different scenarios by which an individual can commit a fraud, ACL data analytics software and strong internal controls can be deployed to detect, identify and ultimately prevent fraud, ideally before it happens. Fraud costs the UK £52 Billion per year, according to latest Annual Fraud Indicator if more robust controls were put in place, would this annual cost be lower? The sooner indicators of fraud are detected, the greater the chance that losses can be recovered and any control weaknesses can be rectified, ultimately reducing business losses. By continuously monitoring operational data and transactions, organisations can catch frauds earlier in the fraud cycle. We offer a Fraud specific ACL Certified Training course, further details can be found on our website or on the course brochure.